What is the PhysioRoom.com Magnetic Waist Support? Neoprene back support with enclosed magnets for the treatment and prevention of sciatica and back pain. To relieve the symptoms of back pain and sciatica. For the relief of back pain when sitting or bending. One size; up to 96cm (37") waist. The width of the belt is approximately 16cm. Sciatica, caused by irritation of a nerve root in the lower back, can produce excruciating pain in the buttock, the hamstring, back of the knee, the calf or the heel. 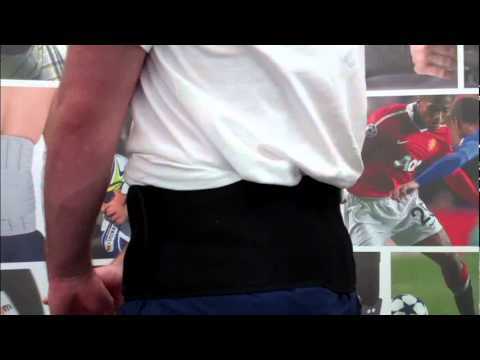 The PhysioRoom.com Magnetic Waist Support provides support and light compression to the lower back region, which reduces pressure on the discs in the lower back - this can reduce the symptoms of sciatica. There are 10 strip sections that each feel have 5 button like magnets. Sciatica may be accompanied by painful back muscle spasms. The combination of neoprene material and magnets used in the support provides therapeutic heat and improves circulation, which relieves muscle spasms in the back and breaks the cycle of back pain. PhysioRoom Magnetic Lower Back Support Belt - Back Brace for Pain Relief from Sciatica is in stock and available for immediate dispatch from our Warehouse facility in Lancashire, UK. Orders placed by 4pm Monday to Friday (excluding Bank Holidays) are dispatched the same day. If you need your PhysioRoom Magnetic Lower Back Support Belt - Back Brace for Pain Relief from Sciatica in a hurry, next working day delivery is available for UK mainland addresses.